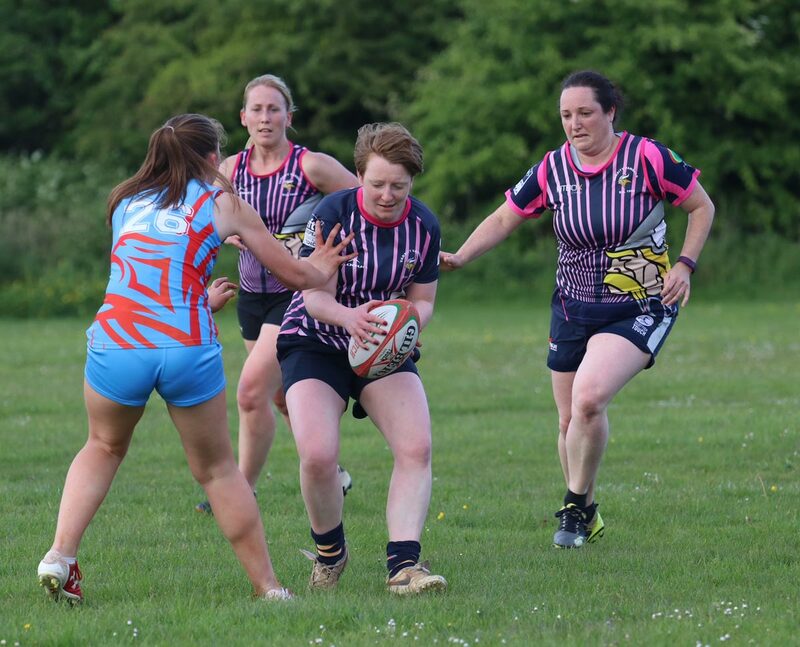 The teams shall consist of 6 players and up to 6 subs who can interchange at any time during the match when they have possession of the ball, or after a try is scored. All players must be correctly attired in team uniforms.That is, similar coloured T shirts. Footwear can be trainers, molded sole boots or rugby boots with blades (winter touch) In summer any rugby boots are fine. The game shall be for the duration of 15 minutes each way. Half time is for end change by teams. Time will be kept by the co-ordinator using a claxon. Atry will be scored when a player with the ball places it on the ground in the opponents touchdown zone. The dummy half cannot score a try but he can cross the opponent’s try line and then pass to another team member who can then score the try. (1 point per try) If the dummy half is touched in posession over the try line before passing, his team will lose possession. After the try has been scored the game will recommence with a tap from the middle of half way. The defending team must be 10 metres from the player taking the tap at half way. The player taking the tap can run and be touched. The touch count will be “one”. From then on, the dummy half must receive the ball from a rollball. 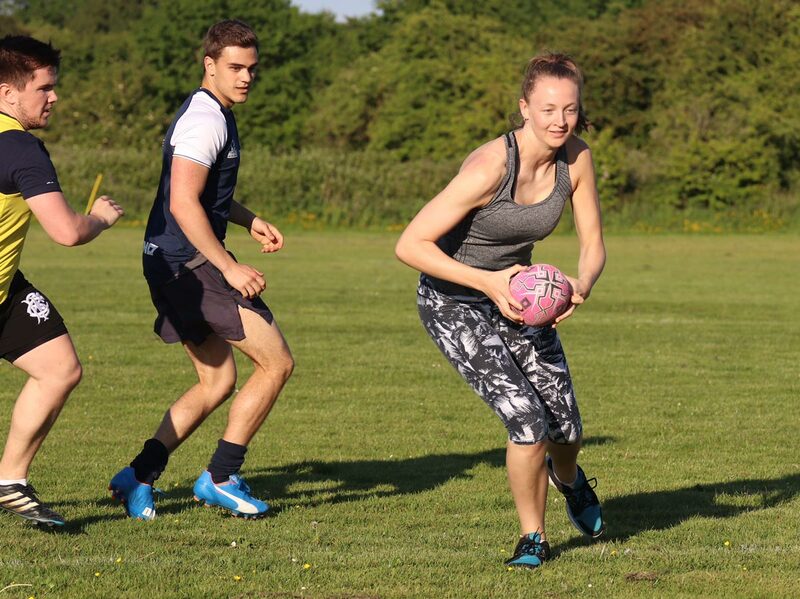 (as in rugby league – the ball being placed on the ground, and either walked over or gently heeled back.) The player taking the rollball cannot be dummy half on the same rollball. The dummy half can run with the ball but if he is touched, his side lose posession. The rollback can take place within 5 metres of the defender’s try line, but the player with the ball can go back to 5 m from the try line if he wishes to. The rollball must not travel more than one metre. A touch is defined where 1 hand contact is made by a defending player on any part of the attacking player’s body or clothing. A touch of the ball carried by the attacking player is also deemed a touch. A deliberate ankle tap is illegal, and will be penalised unless it is in a one to one chase for the touchdown zone and it is the act of a diving lunge by the last defender to stop a try. the direction of the hand must be downwards rather than sideways. A knock on constitutes the ball being dropped or knocked to the ground in any direction. When this occurs the ball is dead, and possession goes to the team not responsible for the infringement. A deliberate knock down by the defending player results in the touch count returning to 0. TOUCH AND PASS If a player passes the ball after a legitimate touch has been made, a penalty will result. Intercepts are allowed provided the players were on side at the roll ball and the ball has not touched the ground. Defending players must be 5 metres back from the rollball. If not the referee has the option of penalising, or to play on if the attacking team gains an advantage. The defending team cannot move forward of the 5 metre line until the ball has been played by the dummy half. not the roller. The attacking dummy half has a maximum of 3 seconds to play the ball or lose possession. If a player runs into touch , or passes forward, possession goes to the defending team. Retiring players must not interfere with play whilst returning on side. A team can only replace or sub players from the ‘sub box’ area 10m either side of the half way. The retiring player must touch hands with the sub on the sideline before entering the field of play. 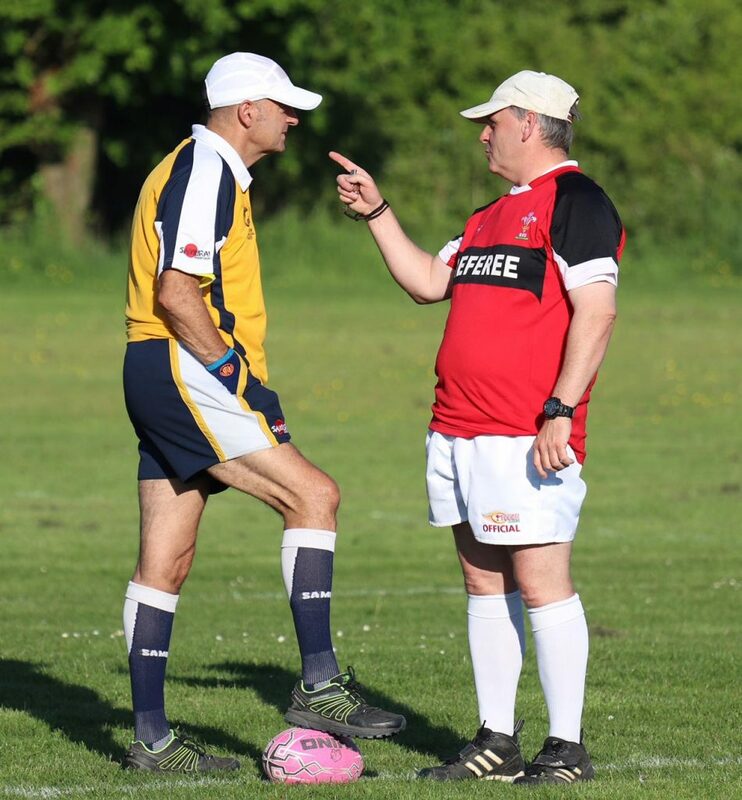 After a try has been scored, substitutions do not have to touch hands, just run on provided there are only 6 players on the field at the restart of play. Foul play of a severe nature will result in the player being sent off. ( the referee being sole judge of fact and time) without replacement for the rest of the match. The said player will be suspended for 1 playing nights. For other offences, (eg bickering with the ref, leg trips, shouldering) the offending player will be sin binned (sent to the touch line) for a period of not more than 5 minutes without replacement. Further foul play will result in the player being sent off. The Referee can also instruct a player to be subbed as an alternative to a ‘bin’ so the player and not the team is penalised. Note the laws relating to the restart at turnover. Is it a roll ball or a tap. The problem of restarts will only be apparent if a player takes a tap rather than a rollball because obviously the tap gives a greater advantage due to the speed of restart. I would not see it as a problem if a team uses a rollball when they should have used a tap as this does not give them any advantage. The referee should play on in this case. If a player starts witha tap and it should have been a roll ball the decision is to bring the player back to the correct mark and re start with a roll ball to the opposition. ‘Travelling’ i.e. playing the ball beyond the place where he was touched.